Gertl is feeling much less yellow (jaundiced) now, and much pinker. Even her neck wrap is pink! 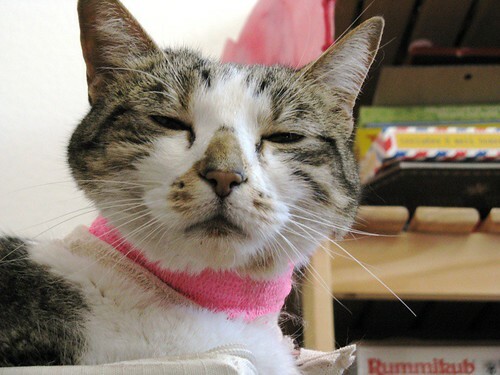 Gert stayed at the kitty hospital for 11 days. She was incredibly lethargic, very jaundiced, and looking like she was not long for this world. They put in a feeding tube and fluids IV, and basically brought her back to life. She's been home for 6 days now, and while she's none to happy about the neck wrap, she's definitely happy to be home and getting more active every day. Feeding her has been a challenge, she needs to be fed 4 times a day, every 4 hours, plus one water-only feeding at night. All through the tube, since she still won't eat or drink. They say the usual time to have the tube in and get them eating again is 4-6 weeks. The food is watered down and then goes through the blender. I have to bring it to about kitty-body temperature and feed it to her through her tube v-e-r-y--s-l-o-w-l-y, otherwise she vomits. Or, like this weekend, sometimes she vomits her entire feeding all over the living room for no apparent reason. It's very challenging, and I'm completely exhausted. But seeing her happy and alert like this is wonderful. Glad to see she's doing so much better! Yeah! So happy to see Gertie is feeling better! And pink really suits her too! i am so happy that she is feeling a bit better!